Norwegian cruise ships are known for their grace, beauty and freestyle mentality that allows the guest the freedom to choose what to do and when. The amenities are amazing, the dining options plentiful and diverse and the shows, activities and nightlife on board second to none. The Norwegian Cruise Line Epic is a first in providing guests more varied cabin options, from the studio a small, made for one space that is geared and priced for the solo traveller, to the private Haven, a set of suites that may be some of the loveliest at sea, featuring tubs, floor to ceiling windows, multiple rooms and space for a whole family to enjoy together. The Epic has entertainment covered, with performances by Blue Man Group, Legends in Concert or the one of a kind show and dinner combination at Cirque Dreams. The Second City comedy troupe performs and there is also Howl at the Moon, a dueling piano bar, and the White Hot Party where everyone wears white and dances on deck in black light lit glory. For the kids, the Norwegian Cruise Line Epic has Nickelodeon character breakfasts, and Nickelodeon Slime Time shows, not to mention the pools, bowl slide and amazing kids clubs to keep them occupied and on the go. Activities abound on this ship, too, where you can experience the first at-sea rappelling wall, go bowling or participate in The Second City’s Presumed Murdered Luncheon, a show and lunch in one that will get you wondering ‘whodunit?’. You can enjoy the Epic on any number of cruise destinations, including those cruises from Miami to the Bahamas that take you on a 7 day journey with stops in St. Maarten, St. Thomas and Nassau. The Epic also has multiple sailings around the Mediterranean, with itineraries that rival the Royal Caribbean Mediterranean cruises, and see stops in Italy, Spain, and France, among others. 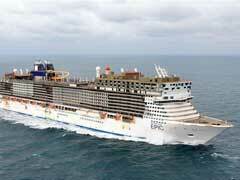 Norwegian Cruise Line Epic is a glorious ship that really does serve passengers an epic adventure at sea. Book early for exclusive Norwegian cruise lines deals to add to the magic of sailing on such an amazing vessel.